Ben came to stay last week. He was with me for two days during the school holiday and of course he wanted to go fishing. On the first day it rained and we went trout fishing but it was hopeless. Conditions were poor and before long we were both saturated and ready for an early bath. Two days later I picked him up again. This time I'd armed myself with a few ragworms and we went down to the coast. 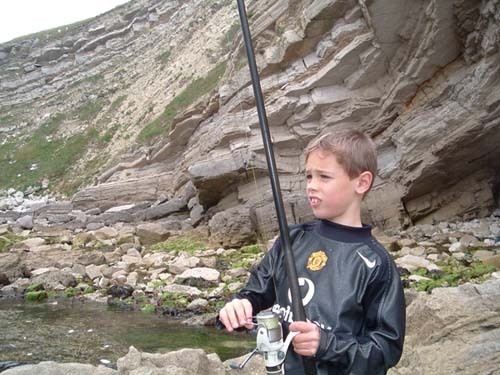 I don't think I'd be popular with Ben's mam and dad if I took him to any really dangerous places but it was low tide and we had few choices of where to fish. I chose a little sheltered cove reached by a mile walk down the cliff path. It was quite choppy when we got to the sea and there was about three feet of water in the only small gap in the bed-to-surface kelp stems. We each had a single size 4 hook and half a wine bottle cork for a float. No need to cast far so no lead. For about five minutes there was no sign of action and I could see that Ben was beginning to have doubts about my choice of venue. His cork dipped, jerked along the surface and zoomed under. A sharp strike and - missed! No bait! Within seconds he was grabbing another worm and before I could turn round he was back in action. This time no wait, bob! bob! bob! zoom! and he was in. A fat little corkwing was soon swimming in a handy rockpool. Next cast he had a bigger corkwing - a male with the black spot and blue-black papilla near its vent. It joined its mate. Next cast the fish pulled much harder and it was a little while before a modest ballan joined the corkwings. 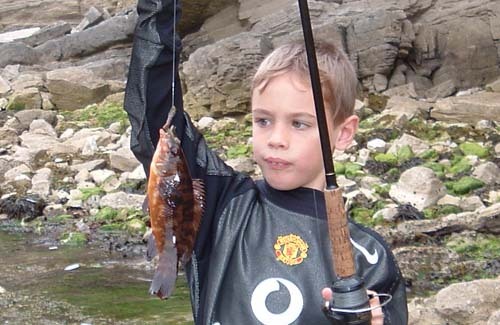 All in all Ben had thirteen wrasse - including the biggest (he was chuffed about that one). 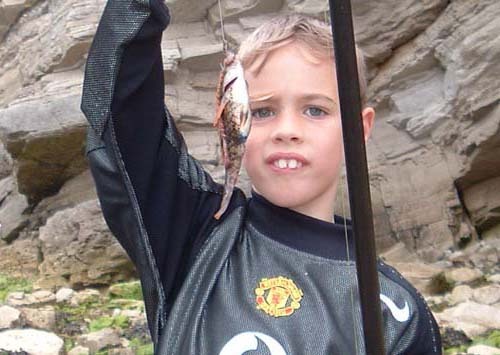 It really takes me back when I do a spot of basic fishing like that. It makes me remember that there is a lot more to fishing than simply trying to catch specimens. I'm sure that's why most of us were hooked in the first place.